Rising high across the Taedong River from the Kim Il-Sung Square, this flame-topped tower represents the national socialist ideology of Juche, often translated as 'Self-Reliance'. The tower is made of over 25,000 granite blocks and stretches 170m (557ft) into the Pyongyang sky. A trip to the top by lift (ideally early in the morning) offers a fine view over the capital. A decadent mausoleum for two communist leaders, Kumsusan Palace of the Sun displays the embalmed bodies of both Kim Il-sung, founder and 'Eternal President' of North Korea, and his son and successor Kim Jong-il. Built in 1976, this gigantic grey palace is surrounded by a large square and a moat. Foreign visitors are only permitted twice a week, but most tours include a visit. A rare historic monument in an overwhelmingly-20th century city, Taedongmun is the eastern gate of what was once an inner defensive wall of Pyongyang castle. The construction dates from 1635, though it sits on the site of an original 6th century gate. It is one of North Korea's few protected historical structures. Kumgangsan, or Diamond Mountain, is perhaps the most famous mountain in North Korea, rising over 1,630m (5,347m). It is part of the country's largest national park, consisting of a range of mountains along the east coast of the country. Its unspoilt, diverse environment is popular with birdwatchers, photographers and botanists. These film studios, in the suburbs of Pyongyang, produce multiple films per year. While most focus on North Korean victories over the Japanese and the Americans, there's also been the occasional Western (a popular genre with Kim Jong-il). Any visit here includes exploring the sets used for historic films, including a Japanese street and some European-style buildings. Myohyangsan, which means 'exotic fragrant mountain', offers pleasant walks and climbs through a contrasting scenery of waterfalls, woods and Buddhist pagodas. But it's what is underneath the mountain that's most impressive. Miles of corridors and rooms carved into the mountain display thousands of gifts presented by foreigners to Kim Il-sung and his son. North Korea's only ski resort, Masikryong sits at the summit of the 1,360m (4,462ft) Taehwa Peak and offers a quiet and peaceful skiing experience during winter. That's because the vast complex, consisting of nine runs spread over an area 940 square miles (plus a luxury hotel, an ice rink, a swimming pool and multiple restaurants) struggles to pull in the locals. Located just outside the capital, and a popular destination with tour groups, Mangyongdae is the supposed birthplace of Kim Il-sung. Visitors will find rows of humble huts and barns that are said to have played host to the Great Leader's early years (although most appear to have been built far more recently). There is also a museum and – rather unexpectedly – a funfair. 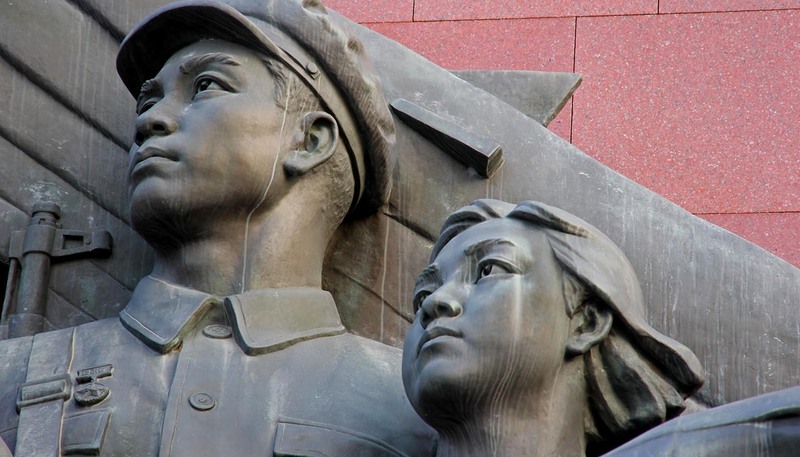 Located just north of the Mansudae Grand Monument, this bronze sculpture is a fascinating mix of Communist ideology and traditional Korean mythology. It depicts a noble, socialist man and woman gloriously riding a Chollima – a mythical Korean steed (akin to Pegasus) that could cover hundreds of miles per day and was considered untameable. One of the regime's most treasured possessions, this captured US warship (or intelligence ship, depending on who you believe) is moored on Pyongyang's Potong River as a museum ship. Visitors will undertake a guided tour of the ship and watch a propaganda video of the ship's capture, the 'humane' release of its crew and the significance of North Korea's victory. This heavily-guarded post on the border between the two Koreas is on the agenda of even the most whistle-stop tours. Visitors will learn (one side of) the story of the Korean War and will be taken into the Armistice Talks Hall where peace was brokered between North and South Korea. Expect to be watched at all times by the wary American troops across the border. Paekdu, on the Chinese-North Korean border, is the peninsula's highest mountain, at 2,744m (9,002ft). It also has great geological significance (as an extinct volcano with one of the world's deepest crater lakes) and mythical status (it is, according to local mythology, the birthplace of the first Korean kingdom). As a visitor, the surrounding natural beauty – forest, waterfalls, streams and abundant wildlife – is also rather special. Pyongyang's main square periodically plays host to North Korea's huge military parades. But even when it isn't, it's a worth visiting for the imposing concrete buildings surrounding the square. Take a trip inside the Grand People's Study House (home to an extensive local library collection) and the Korean National Art Gallery (home to the country's best socialist realist art). Many ancient buildings in Kaesong, capital of the peninsula during the Koryo Dynasty, bear witness to Korea's long imperial history. Highlights include; Sonjuk Bridge, a small stone structure dating back to 1216; the 14th century tombs of King Kongmin and his Mongolian queen; and the traditional Korean old town with original Joseon-period buildings. Marking the precise spot where Kim Il-sung first addressed the Korean people after the end of the Japanese occupation in 1945, Pyongyang's giant triumphal arch is, quite deliberately, ever-so-slightly taller than its famous cousin in Paris. Unveiled in 1972 to celebrate the 60th birthday of president Kim Il-sung, this gigantic bronze statue on a hill in Pyongyang is venerated by North Koreans. Foreign tour groups are routinely requested to bow in front of statue and present flowers at its feet. Since 2012, Kim Il-sung has been accompanied by an equally-enormous statue of Kim Jong-il.